” Then later in the week I ran across a news story which at first I thought was a parody from The Onion. Only, it wasn’t. Instead it detailed how this week’s AutismOne conference was heavily promoting a new treatment which claims to have “recovering” 38 children from autism. As it turns out the the “treatment” involves practitioners and parents giving children with autism an enema with a solution called Miracle Mineral Solution or MMS for short. This chemical compound it more commonly known as industrial strength bleach. Perhaps there are more horrifying things than bleaching autistic children: maybe you’re weary after the A bomb and the Holocaust and you’ve retreated to your private sanctum to watch reruns of “Three’s Company” forever–but for the rest of us who still believe in medical ethics, human dignity, civil rights, real science, well, this is a moral catastrophe. It’s another instance of outright ignorance mixed with “normative” parents’ fears of disability. Only absolute ignorance and fear can create a “pillow angel” or a child forced to receive toxic chemicals via enemas. We recommend Sunday’s blog, for her activism and her streetwise humor are sharp, literate, and brave. 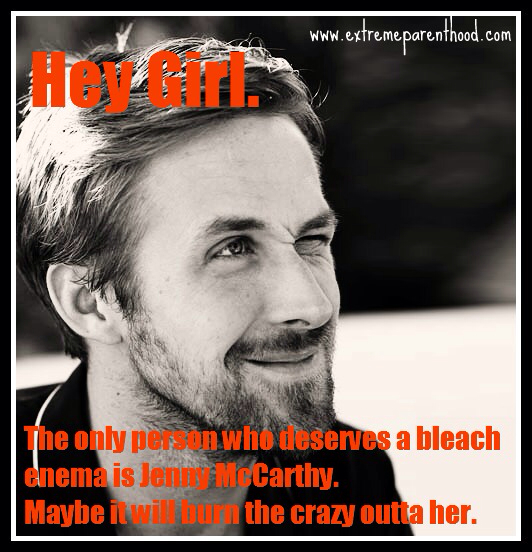 You will like her Ryan Gosling send ups too! The poster is masterful genius.